What a weekend. Britain has won eight gold medals in two days of wonder at London 2012, adding to the eight we won in the previous three days. The whole nation has been enthralled and proud. The slogan of these Olympics is ‘inspire a generation’. 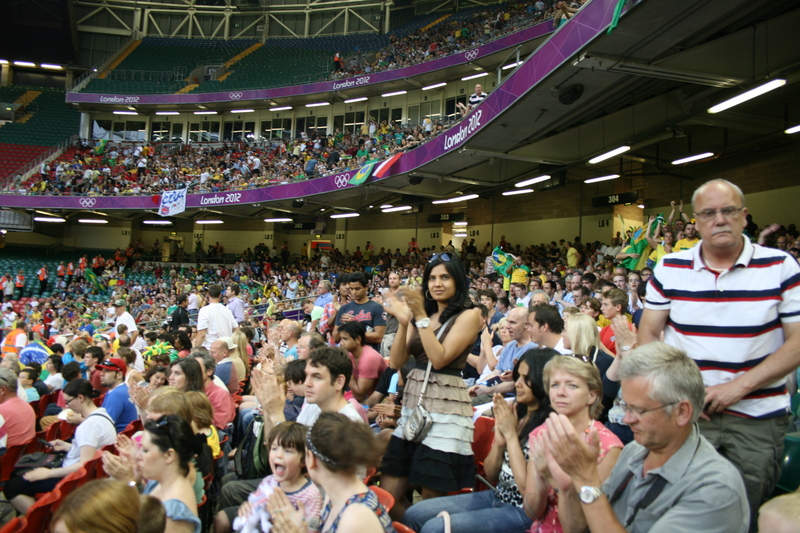 We saw it everywhere at the Millennium Stadium when we went to the very first London 2012 event 11 days ago. The events of the last few days suggest it’s more than a slogan. I can imagine a huge increase in interest in cycling, rowing and athletics over the coming weeks as people of all ages want to try the sports that have featured in Great Britain’s success. It’s not just about winning. I’ve liked the way the British media have reassured those who didn’t scale the heights that they’ve done us proud. That’s another lesson for anyone inspired to compete in sport: you can do no more than your best. It’s good to celebrate true endeavour in an age when worthless celebrity carries too much cachet. This entry was posted in Britain, London, Sport and tagged London 2012, Olympics by Rob Skinner. Bookmark the permalink. It has been – and continues to be – a terrific success story and a terrific morale booster for the country when all around is such a shambles. It has been wonderful not to have the papers focussing endlessly on the vainest of the vain and over-indulged – the politicians and bankers – but, instead, to record stories of individual effort, sacrifice and success. Heartwarming. So glad we went to see the torch locally and the TeamGB Girls play at Wembley, also locally. Lovely words, Trevor. I watched GB women football team on TV in their final game. So sad to see their magnificent adventure end having seen them kick of London 2012 in Cardiff. UK has much to be proud about – just returned from a great trip including an evening at the Olympic stadium. One group that should be mentioned are the thousands of volunteers – their good spirit, politeness and verve for keeping everyone happy was terrific. … Kudos. Thanks Ted – glad you enjoyed it. See, we are almost as good at putting on a party as the Irish!